Humana is one of the country’s largest health and wellness benefits companies and, by nature of the industry, battles public perception that is critical and untrusting. To break this cycle, Coyne supports national sponsorships, wellness initiatives, regional brand building and business marketing efforts. Our work has resulted in nearly one billion media impressions, nearly all positive in sentiment, and 38 communications awards. Humana reported an impressive 17 percent market share of Medicare Advantage membership in 2017. Coyne PR revamped Humana’s signature CSR program, Humana Communities Benefit, which grants local non-profits with funds to address community health. Coyne activated local communities and media with an online vote to rally behind their hometown non-profits, all the while building affinity for Humana’s dedication to local non-profits. Coyne PR worked with Humana to debut Freewheelin, the largest single bike-sharing initiative to promote healthy living and healthy communities, by bringing 2,000 branded bikes to the Republican and Democratic National Conventions. The campaign generated hundreds of millions of media impressions; multiple national awards, including a PRSA Silver Anvil; and the attention of politicians and policy makers throughout the nation. As a result, Freewheelin has served as a model of bike sharing implementation for some of the country’s biggest cities, and established Humana as an innovative healthcare leader. Humana partnered with Coyne PR to amplify its presenting sponsorship of the National Senior Games, the largest sporting event for people age 50 and older in the U.S. The Coyne team created the Humana Game Changers program to honor athletes who motivate and inspire seniors of all ages and abilities to live active, healthy lifestyles, generating hundreds of stories with local and national media and increasing consideration for Human’s Senior Products. The Taste of Chicago is the nation’s largest food festival and one of the most popular summertime events in the city. 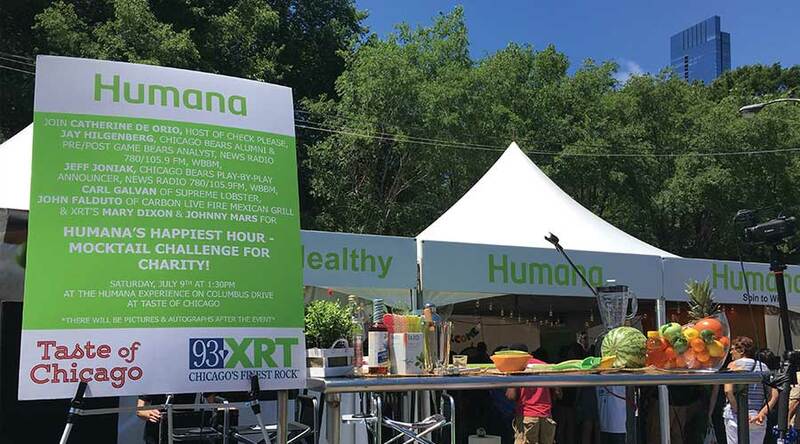 Coyne PR partnered with Humana to promote its Healthier Choices program at the festival. The program offered lower-calorie options, all denoted with a green apple. Coyne blanketed Chicago-area media with the healthy options, including recognition from the Chicago Tribune for Humana with an “A for Effort” distinction in its “Golden Spork” awards.